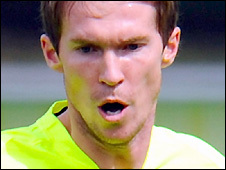 Birmingham City midfielder Alexander Hleb says the chance to return to the Premier League was too good to refuse. The Belarus international arrived at St Andrew's on loan from Barcelona after two frustrating years at the Nou Camp. "I wanted to leave for the Premier League because I am happy here, it was the best three years of my career," the former Arsenal player told BBC WM. Hleb is yet to train with his new club after picking up an ankle injury on international duty. But the 29-year old is optimistic that he can play some part in Sunday's Premier League game at home to Liverpool. "It's 50-50, I spoke to the coach and the doctor and he thinks we have a chance - the first day I thought it was very bad, but it's not so bad." It is the second successive season that Hleb has been loaned out having spent last season with Stuttgart in the Bundesliga. That follows a peripheral role in Barcelona's treble winning season of 2008/9. "Yeah, in Barcelona it was difficult because if the coach doesn't give you a chance, you don't play," he said, acknowledging his awkward relationship with the Catalan club's coach Pep Guardiola. "I was just sad, I wanted a change, I wanted to leave - it's okay when the coach stays behind you. If not - non chance." Although the Premier League is familiar territory for Hleb, few of his new team-mates are as easy to recognise. Some have crossed his path before though. "I know (Seb) Larsson, he's a very good player and I played with him in Arsenal. And this new player Martin (Jiranek) from Spartak Moscow. "I know (Barry) Ferguson is a very good player, I played against him as well - I know a lot of players as I play with Arsenal and with the national team against these players. "A good team, maybe not in this top four, but good and we'll try." While Hleb and Jiranek may make Alex McLeish's 18-man squad for the Liverpool game, the third deadline day signing Jean Beausejour is not in contention. The Chile international winger is yet to receive a work permit, and is now expected to arrive at the club next week.